It feels like I haven’t done a full review in ages. I missed you guys. Well, most of you guys. I decided to take time out of my busy Sunday to hang out with the thunderstorms and a nice little Torano Vault. The Good Stuff: In 2011 Torano released two new blends. The Loyal, which was a value line, and the Vault. The Vault is said to be based on a blend that is contained in files that reference every blend Torano has ever experiemented with. The “Vault” is based off a blend created in 2000 called the A-008. 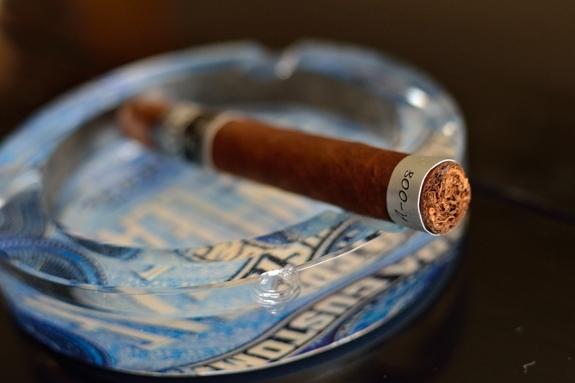 The A-008 contains a Shade Grown Nicaraguan Colorado wrapper, Honduran Jamastran Binder, and Nicaraguan Condega and Esteli fillers. After recreating and testing he blend, Charlie Torano decided to add an ingredient that wasn’t available at the time, a second Nicaraguan Ometepe binder. 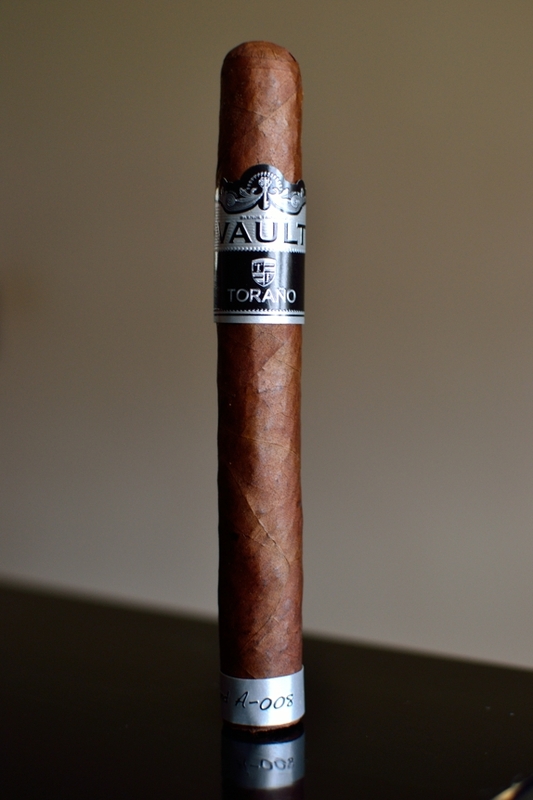 The Vault comes in four basic sizes: The Robusto (5 x 52), Toro (6 x 50), Torpedo (6 1/4 x 52), and Corona Gorda (5 5/8 x 46). The cigar comes packaged in boxes of 20 and run between $6.80 to $7.95 a stick Though I do see these go on sale quite often. Big thanks to one of our great readers Jeff who sent this my way to get my thoughts. I’ve smoked a few of these prior to the review, but never got around to reviewing one. Prelight: Torano’s Vault starts out with a beautiful, chocolate brown wrapper. The wrapper is crazy consistent in color with only a few dark blemishes throughout the body of the cigar. There are a few very small, smooth veins and lots and lots of oil. The slender body leads up to a nice, round, double cap. 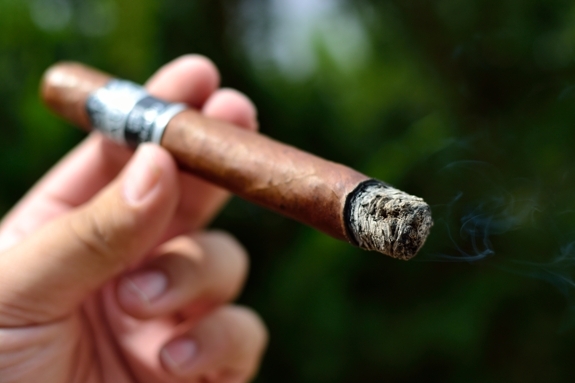 The cigar has a few soft spots throughout the body of the cigar but the wrapper feels tough and firm. Let’s just hope those soft spots don’t lead to burn issues down the road. The Vault is polished off with an elegant silver and black band with the word “Blended from the VAULT” and the Torano crest on the front. 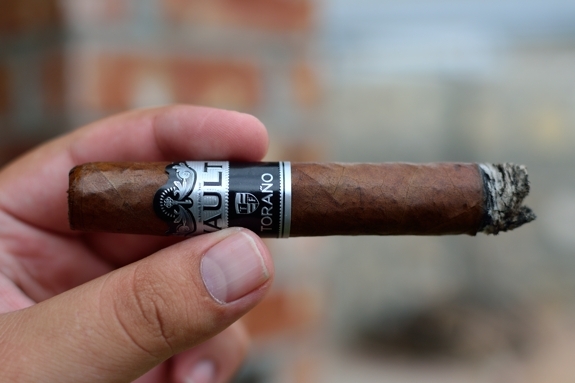 The Vault also carries a salute to it’s parent blend with a small silver foot band with “Blend A-008” scribbled on it. The wrapper on the Vault gives off only a very slight tobacco aroma while the foot of the cigar lets out some soft sweetness, chocolate, and tobacco. The cap cup very easily using my double bladed Palio cutter. The cold draw was surprisingly full with very bold spice and an oaty/grainy type mixture. First Smoke: The Vault starts out with some very sharp spice, a bit of citrus, lots of cedar and chocolate with just a pinch of black pepper. The pepper faded very quickly leaving behind even more sweet spiciness. The draw is very nice. I get a perfect amount of thick smoke with every puff. The burnline started out pretty crappy with two huge waves. It’s a bit gusty out so it may be due to the wind, or it may be those soft spots that I encountered in the prelight. Either way, I’m not going to touch this up just yet. The ash left behind is pretty flaky and dark gray and black in color only holding on for about a half an inch before giving way. Halfway There: I’m not getting any of that citrus that I picked up in the first third now. 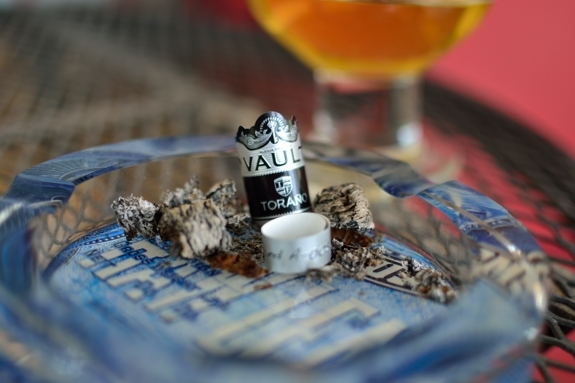 Instead, Torano’s Vault has ramped up in terms of cedar and spice, introduced some nice coffee notes, and brought the black pepper back into the mix. This cigar is really starting to shine into the second third and I am anxious to see what we have in store for the finish. The retrohale is what I expected, lots of the sweetness and cedar with some pepper. It’s not bad, just not great. I’ll stick to keeping the smoke in my mouth. I am happy to report that the burnline has really started to correct itself with no attention from my lighter. Just as I had hoped it’s now only slightly wavy and I am feeling almost no nicotine from the cigar yet. My main complaint is the ash is so loose it’s falling all over the place. Finish: The body flavors, and strength remained very similar in the final third. The pepper is still there, lots of chocolate/coffee, tons of sweetness, cedar and spice. I’m really impressed with not only the amount of flavor the Vault kicks out, but how well it kept it’s flavor without fading out. The draw has been perfect the entire experience. While I never had to touch up the cigar, the waves have returned in the final third making the burnline a bit crazy. I won’t complain about it too much, but I could see it being a nuisance. It took me about an hour and a half to smoke this cigar down to the nub and I experience only a very slight bit of nicotine towards the end, and absolutely no harshness at all. Overview: This was a solid cigar. I found many of the Torano blends I have smoked in my time are very hit or miss, but just about all of the newest blends I have smoked have been great. The Vault has enough complexity to keep me entertained and the full body approach was great. I really wish I didn’t have to deal with so many burn issues. I encountered this on all the Vaults I have smoked and it might be something to do with the double binder. I’ll tell you one thing though, I much rather have the burn suffer instead of the flavors. To Sum it Up: It’s a good cigar, at a decent price. This may sneak into my regular rotation from time to time, I just wish the construction was a bit better. The flavors are bold and it makes for a great evening, after dinner smoke while the strength remains on the medium end. 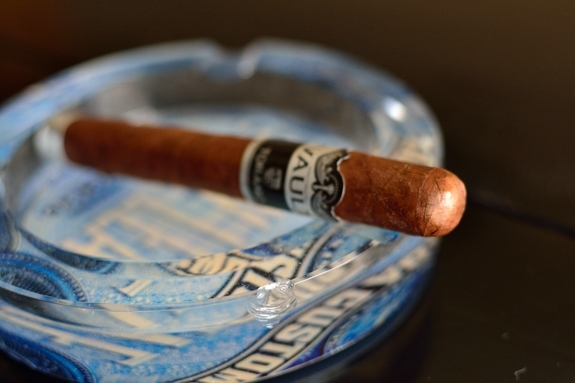 This cigar is perfect for novices looking for a full-bodied experience without being knocked on their asses and the complexity is enough to satisfy the pickier cigar smokers. I’d buy it again for sure, but I don’t think I’d shell out for a box of these unless I found them at an unbeatable price (which happens often with this company). 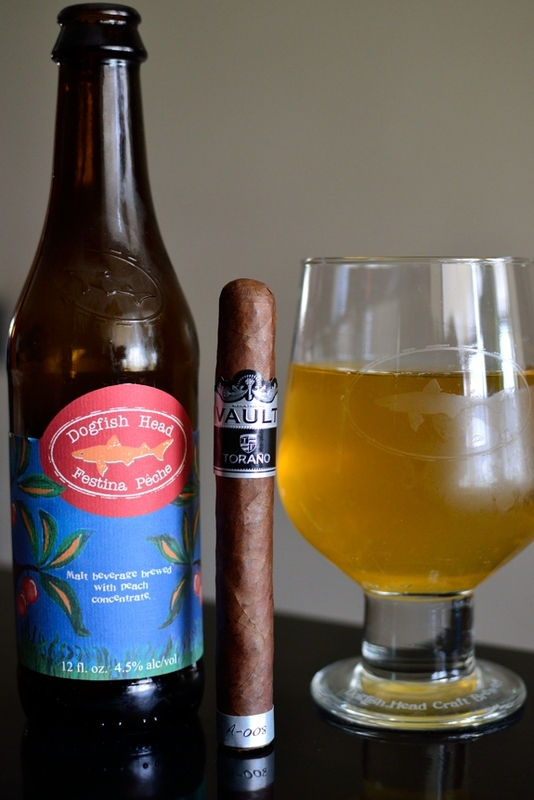 Pairing: Dogfish Head’s Festina Peche has become a staple to their summer portfolio. While it’s labeled as a “Weissbier”, it doesn’t carry the same characteristics as most Weissbiers. In fact, I would consider this brew closer to a mild sour. Thin and smooth Festina Peche starts out with some sharp sourness leaving behind a sweet peach and citrus flavor. This beer is a bit one dimensional, but that’s great when you are just looking for something smooth and refreshing and the brew is just that. It’s one of those beers you’d love to take back after an hour of yard work. It’s also very light and comes in at only 4.5% ABV so it’s not going to fill you up or leave you with any sort of buzz. This pairing wasn’t perfect, as the sourness and citrus really only married up with the first third of the cigar, but it went perfectly with my mood, and the weather. Sometimes, that’s all that counts. If I had to choose another pairing for this cigar I think it would go awesome with a Marzen or even a sweet Brown Ale. Thanks for taking the time to review this one, Tony. I also have the same problem with flaky ash falling unexpectedly (but not the wavy burnline), but to me the flavors more than nake up for it. I just have to remember to ash more often and not wear black. 😉 I didn’t have the ash problem with the robusto size, although it lacked the depth of flavor that the corona gorda has. Being that they can be had at a fairly substantial discount, it will be a staple in my humidor, and it goes great with coffee, too.